What it looks like if you close MediaViewer. Yes, I uploaded a screenshot of a black tab. Click on the picture for "Juli Matthews of Swagbot". MediaViewer is loaded. Click the X to close MediaViewer. 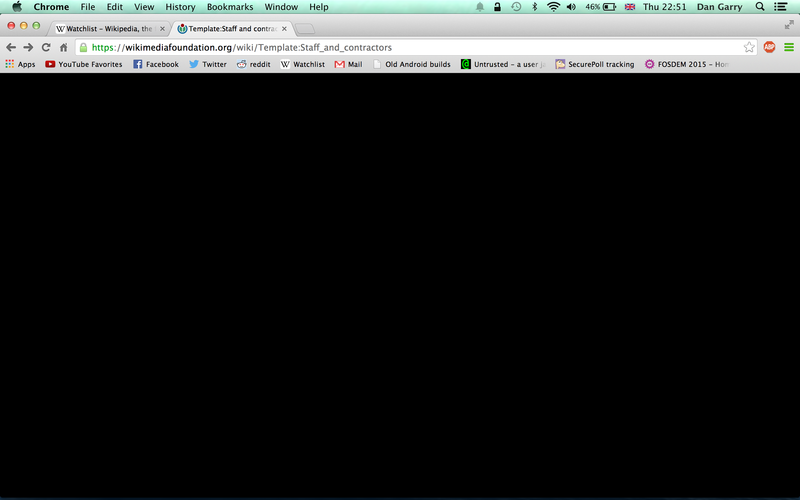 Obtained result: That tab is now a completely black screen, and it cannot be dismissed. bzimport set Reference to bz70756. Weird... https://wikimediafoundation.org/wiki/Staff_and_contractors?showall=1 works but the template does not. Same issue as https://wikimedia.mingle.thoughtworks.com/projects/multimedia/cards/825 : the domready handler in mmv.bootstrap.autostart.js is never called, even though the $(document).ready(handler) call itself is executed. Well, not quite the same issue because that was Firefox-specific and this can be reproduced in Chrome. But the underlying issue is the same: something removes domready event handlers. Given that the error is specific to this page, it might be related to the script embedded in the template to show/hide departmental lists (which works on the staff page but errors out on the template page). I really don't see how though. The error can be reproduced in debug mode, so it can't be errors in one script affecting other scripts due to ResourceLoader concatenating them. so some script might be messing with jQuery internals. ... "resolved" on both pages. This is jQuery bug #10251  (wontfixed). Basically, when a $(document).ready() handler has an error, all subsequent handlers fail to run. Given that gadgets are usually loaded before exceptions, this is bad and a generic solution is needed; but since that looks hard, and this issue affects MediaViewer in a rather severe way (a couple users complained about a BSOD - they were probably using broken user scripts which prevented the loading of the MediaViewer event handler which removes the black overlay), we should probably implement a local workaround. Works after pushing out the patch via SWAT. The underlying issue (local site JS onready handlers throwing errors will prevent onready handlers of extensions from being called) is tracked as bug 70772. Confirmed fixed (tested in FF32 and Chrome35).